Keep that mess of cables and cords hidden away under the desk, next to the computer or behind the TV. You don't have to unplug anything to set it up. Just open the lid, place the surge protector or cable box inside, close the lid and you're set! 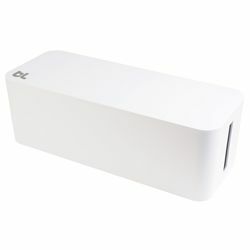 CableBox is designed with cable outlets on the outside of the box and is outfitted with rubber feet so it won't slip. Designed to fit all shapes and sizes of surge protectors and power strips, the lid is also the perfect spot to place connected devices.